We grab a coffee with IBMers from around the world, and share our chat in this weekly spotlight series. 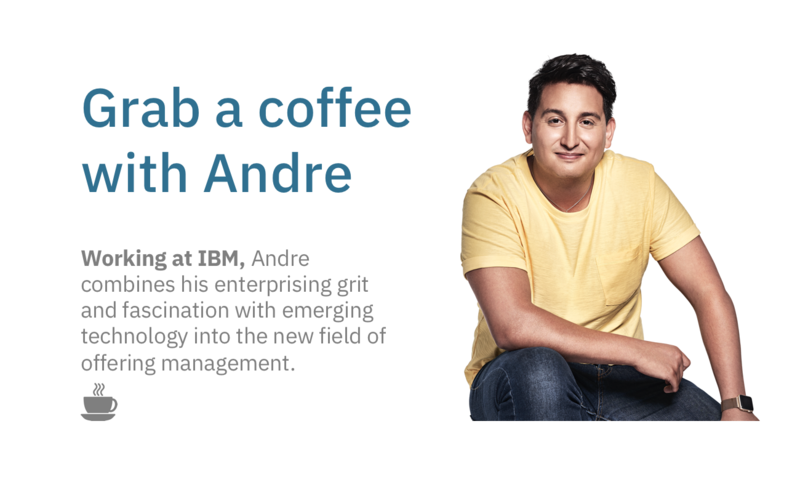 This week you can meet Andre, from IBM US. with a little bit of milk and dash of honey. partner meetings, it’s always nice to talk to our partners and see the dynamics between companies, specially when it comes to tech giants. go-to-market strategy and enablement for the whole Security & Compliance ecosystem for the “IBM Cloud for VMware Solutions” portfolio. involves multiple meetings with internal and partner calls, varies around but usually goes from marketing calls to engineering to OM reviews. I get to work in an industry (hybrid cloud) that is growing everyday, plus traveling to visit clients and partners is not a bad gig. The biggest challenge I have…. I wouldn’t say challenge but trying to absorb as much information as possible, sometimes it can get overwhelming. stepping into our Armonk HQ and sitting in the same room Louis Gerstner gave his first commanding orders as CEO. meet, meet, meet as many people as possible, IBM is so big that you can make a very extensive network of brilliant individuals.